For all household removals within the UK we provide a professional, reliable service from the moment we arrive to remove your personal effects to the point of delivering and setting up your furniture in your new home. Being based in Eastbourne, East Sussex you can enjoy a professional service from your local removals experts, as well as local storage if required. We understand the importance of having a removal company that you can trust to take maximum care of your belongings. For many of our customers they simply require us to carry out the removal. Others might just require a supply of removal boxes. Others prefer us to help pack and let the removal firm do all the hard work. Whatever your removal requirements we can help. What about delays on removal day? We have our own dedicated warehouse storage facilities in Eastbourne and so if your removal is delayed we can safely store your possessions until you can get access to your new home. What if there is a big gap in moving - Storage to meet your needs? Again with our dedicated secure storage in Eastbourne we can keep your belongings safe for months or even years and we can deliver everything when you're ready. We provide a full commercial removal service from a single office relocation to a manufacturing unit to a warehouse move, call us today to see how we can make the move as simply as possible for your company. Many of our drivers have now completed the Crossrail Lorry Driver Induction Training programme which has been developed in consultation with cycling and road safety campaign groups and the construction industry. With 40 years of service to Eastbourne and the surrounding towns and villages in East Sussex we have a reputation to keep and grow. Our vast experience and knowledge help us to ensure the smoothest of removals for you, taking care of the essentials. We can help whether your moving from one-side of Eastbourne to the other or if its a move to Scotland and beyond. Our current score on Checkatrade is 9.91 - click here to find out more! 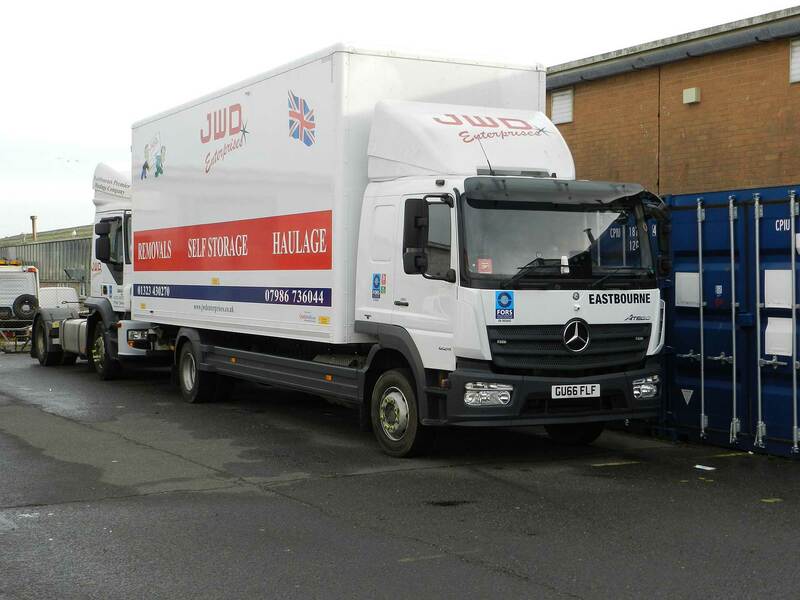 We have just added some brand new removals lorries to our fleet! JWD now offer a whole range of warehousing storage solutions, call for more!